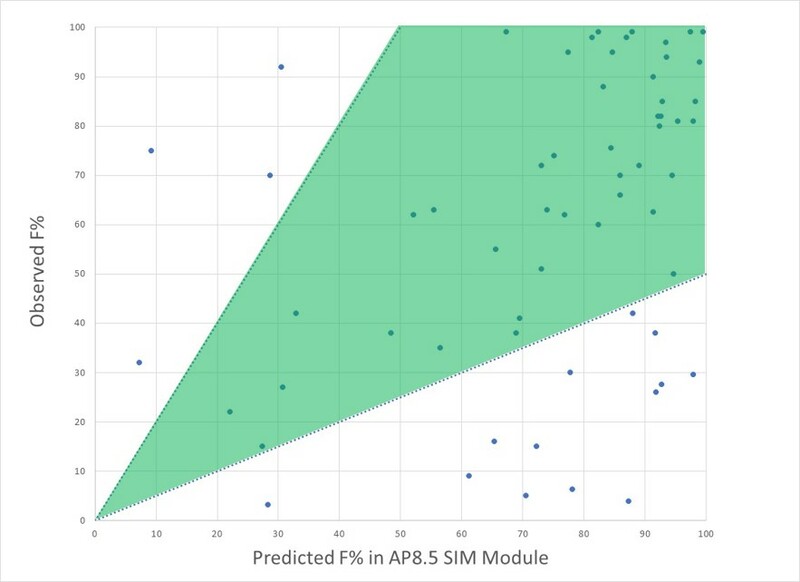 What is the HTPK Simulation Module? The algorithm uses our Advanced Compartmental Absorption and Transit (ACAT™) model to simulate dissolution, transit, and absorption in the GI tract. Prediction of oral bioavailability requires intrinsic clearance in the liver. This value can be obtained using our predicted rat or human liver microsomal clearance (CYP_RLM_CLint or CYP_HLM_CLint) models or clearances from in vitro experiments, e.g., liver microsomes or hepatocytes. Estimation of the dose required to reach Ceff requires systemic clearance that can be predicted from our estimates of liver and kidney clearance or from a user input systemic clearance. The module can be run at the command line in order to incorporate it into KNIME or PipelinePilot™. Below are more details on the output properties of the module. The percent of an orally dosed drug that is absorbed into the gut lumen is a limiting factor in the overall exposure of the compound since the oral bioavailability can never be higher than the fraction absorbed (Fa% or %Fa). The default setup estimates Fa% for four oral doses (1, 10, 100, and 1000 mg). 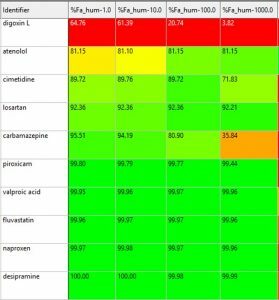 Users can specify their own dose values or a column in the spreadsheet that contains different doses for each compound. Users can also specify rat physiology in order to predict Fa% for this important preclinical species. 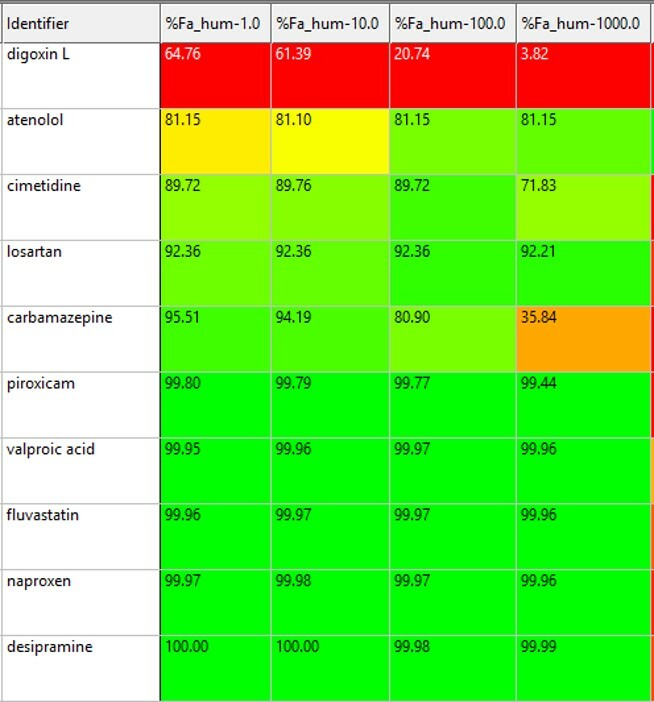 The table on the left shows results for ten drugs. Half of the drugs have high fraction absorbed (>99%). Atenolol and losartan have lower Fa% values. These two compounds have the lowest predicted human jejunal permeability aside from digoxin L. The fraction absorbed values for digoxin L, cimetidine, and carbamazepine decrease with increasing dose. 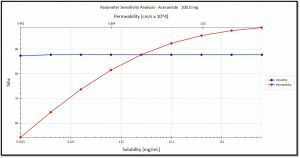 These compounds have lower predicted solubility at pH 7.4 than the other compounds in the data set. The ability to predict oral bioavailability (F% or %F) was added in ADMET Predictor version 8.5. 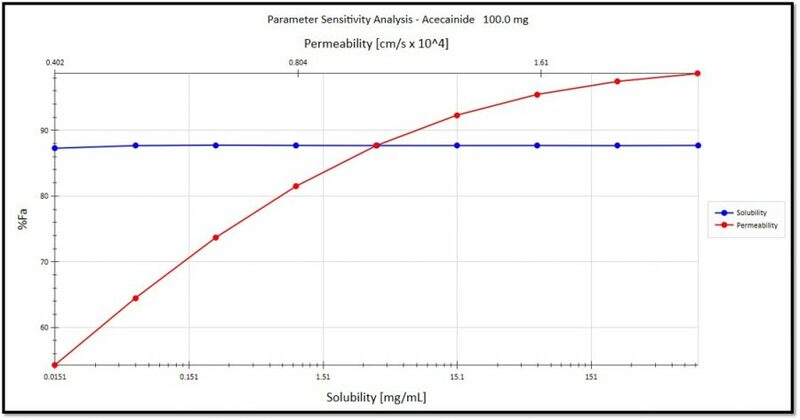 Observed versus predicted oral bioavailability for a set of 62 compounds is shown on the left. Seventy-three percent (73%) or 45 of the molecules have predicted F% within two-fold of the observed values. Sixty-five percent (40 molecules) are within 1.5-fold of the observed value. 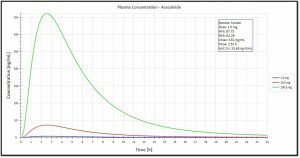 Oral dose levels, in mg, necessary to reach the desired total plasma concentration (Ceff) of drug candidates at steady state can be assessed using the new Simulation Module in ADMET Predictor 8.5. 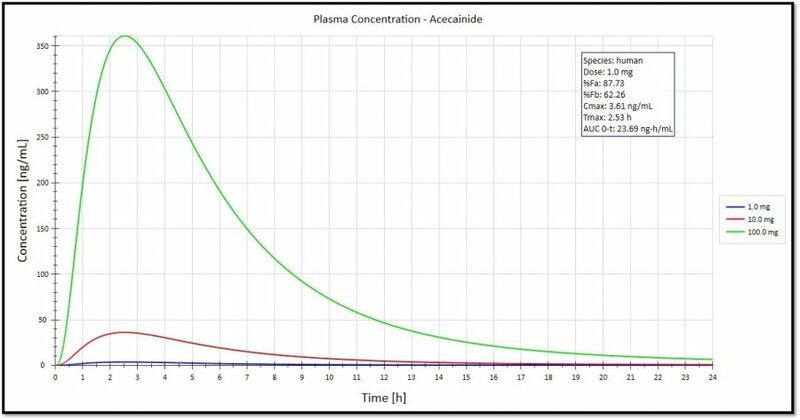 The steady state is determined by the model is a state where administration of additional dose does not lead to further increase in “peak and trough” plasma concentrations. Systemic clearance can be estimated by liver and kidney clearance using our models (hum_fup%, RBP, CYP_HLM_CLint, rat_fup%, RBP_rat, CYP_RLM_CLint) or a user supplied systemic clearance. For example, drug discovery scientists can estimate the dose required to achieve a plasma concentration that is greater than the IC50 of the compound which is required in order for the compound to be efficacious in vivo. Similarly, toxicologists can predict if a compound has sufficient plasma concentration necessary to produce a toxic effect in rats or humans.